"Ch. The McGillacudy, Irish wolfhound owned by Clyde B. Smith, Cooper Rd., Middletown. is mascot of the 69th regiment in New York city. Second place in the Hound Group at Meet the Breeds!! Thank you to the Florida contingent for the great booth! The new litter announcement function is now available on the website for club members! 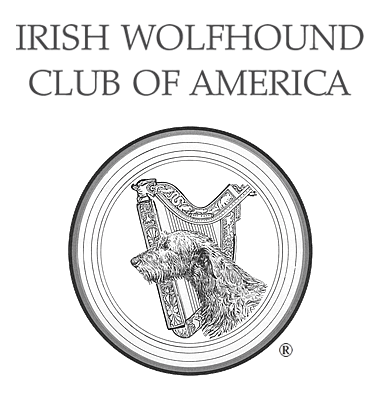 The Irish Wolfhound Foundation has made the PowerPoint slides from the cardiac presentations given by Dr. Tyrrell and Mariellen Dentino at the 2016 IWCA National Specialty show permanently available on their website. Since 2012, the IWCA has been in support of the Irish Wolfhound Clubs in Australia's breeders' efforts to combat DOGS Victoria's insistence on registering Irish Wolfhounds with dubious parentage. A ruling earlier this month appears to be a step toward remedying this matter. The Irish Wolfhound Health Group in Great Britain is working with the University of Nottingham to survey owners who have had Irish Wolfhounds with osteosarcoma.